Kawasaki disease is a multiorgan disease. During the acute phase, children may develop aseptic meningitis, hyperemic tympanic membrane, or uveitis. Neurologic complications, which include facial nerve palsy, seizures, and ataxia cerebral infarctions, are rare. Other common features include diarrhea, vomiting, abdominal pain, and pneumonitis. Gallbladder hydrops (acute acalculous distention of the gallbladder; see image below) may occur in the first 2 weeks of illness, it may be the result of the extension of periportal inflammation to the cystic duct, and it is typically self-limited. Arthritis and arthralgia are common in the acute phase. Findings that include erythema and induration at the site of recent Bacille Calmette-Guérin vaccination, testicular swelling, and peripheral gangrene also have been reported in patients with this disease. Kawasaki disease. 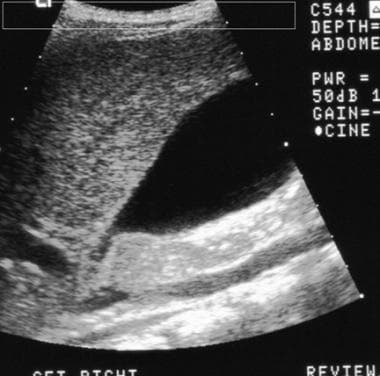 Sonogram of the right upper quadrant shows hydrops of the gallbladder. Note the size of the gallbladder compared with that of the inferior vena cava. Courtesy of Dr S. Methratta, UMDNJ-New Jersey Medical School. The ECG is usually normal. 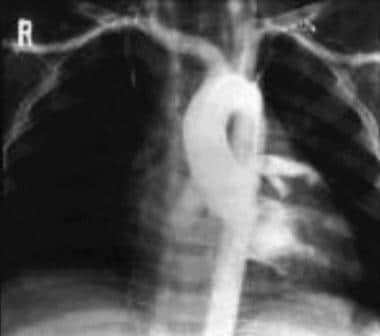 If coronary aneurysm and calcification of the coronary artery aneurysm wall are present, they may be detected as cystic calcification in the region of the coronary vessels, overlying the heart shadow. Although no published data describe the use of CT in detecting Kawasaki-related coronary aneurysms, recent advances in multihelical technologies, as well as electron-beam CT, may be useful in detecting and sizing coronary artery aneurysms. CT is also useful in evaluating the size of the gallbladder and in detecting gallstones. Angiography may be used to evaluate for coronary aneurysms (see the image below). Although it is considered to be the criterion standard for evaluating coronary aneurysms, ultrasonography provides an alternative method of detecting coronary aneurysms, particularly proximal ones. Kawasaki disease. Angiogram of the ascending aorta and coronary vessels shows aneurysmal dilatation of the coronary vessels. Courtesy of Dr Chong Hyun Yoon, Professor of Radiology, University of Ulsan, Seoul, Korea. AHA. Diagnostic guidelines for Kawasaki disease. American Heart Association Committee on Rheumatic Fever, Endocarditis, and Kawasaki Disease. Am J Dis Child. 1990 Nov. 144(11):1218-9. [Medline]. Japan Kawasaki Disease Research Committee. Diagnostic guideline of Kawasaki disease. Tokyo:. Japan Kawasaki Disease Research Committee. 1984. Leung DY. Kawasaki disease. Curr Opin Rheumatol. 1993 Jan. 5(1):41-50. [Medline]. Shulman ST, De Inocencio J, Hirsch R. Kawasaki disease. Pediatr Clin North Am. 1995 Oct. 42(5):1205-22. [Medline]. Kawasaki T. [Acute febrile mucocutaneous syndrome with lymphoid involvement with specific desquamation of the fingers and toes in children]. Arerugi. 1967 Mar. 16(3):178-222. [Medline]. Kawasaki T, Kosaki F, Okawa S. A new infantile acute febrile mucocutaneous lymph node syndrome (MLNS) prevailing in Japan. Pediatrics. 1974 Sep. 54(3):271-6. [Medline]. Lapierre C, Bitsch A, Guerin R, Garel L, Miro J, Dahdah N. Follow-up chest X-ray in patients with Kawasaki disease: the significance and clinical application of coronary artery macro-calcification. Pediatr Cardiol. 2010 Jan. 31(1):56-61. [Medline]. Cantin L, Chartrand-Lefebvre C, Marcotte F, Pressacco J, Ducharme A, Lapierre C. Coronary artery noninvasive imaging in adult Kawasaki disease. Clin Imaging. 2009 May-Jun. 33(3):181-7. [Medline]. Katsumata N, Aoki J, Tashiro M, Taketomi-Takahashi A, Tsushima Y. Characteristics of cervical computed tomography findings in kawasaki disease: a single-center experience. J Comput Assist Tomogr. 2013 Sep-Oct. 37 (5):681-5. [Medline]. Han BK, Lesser A, Rosenthal K, Dummer K, Grant K, Newell M. Coronary computed tomographic angiographic findings in patients with Kawasaki disease. Am J Cardiol. 2014 Dec 1. 114 (11):1676-81. [Medline]. Tacke CE, Romeih S, Kuipers IM, Spijkerboer AM, Groenink M, Kuijpers TW. Evaluation of cardiac function by magnetic resonance imaging during the follow-up of patients with Kawasaki disease. Circ Cardiovasc Imaging. 2013 Jan 1. 6(1):67-73. [Medline]. Mavrogeni S, Papadopoulos G, Hussain T, Chiribiri A, Botnar R, Greil GF. The emerging role of cardiovascular magnetic resonance in the evaluation of Kawasaki disease. Int J Cardiovasc Imaging. 2013 Aug 15. [Medline]. Fujiwara M, Yamada TN, Ono Y. Magnetic resonance imaging of old myocardial infarction in young patients with a history of Kawasaki disease. Clin Cardiol. 2001. 24:247-52. [Medline]. Greil GF, Seeger A, Miller S, et al. Coronary magnetic resonance angiography and vessel wall imaging in children with Kawasaki disease. Pediatr Radiol. 2007 Jul. 37(7):666-73. [Medline]. Mavrogeni S, Papadopoulos G, Karanasios E, Cokkinos DV. How to image Kawasaki disease: a validation of different imaging techniques. Int J Cardiol. 2008 Feb 20. 124(1):27-31. [Medline]. Phadke D, Patel SS, Dominguez SR, et al. Tissue Doppler Imaging as a Predictor of Immunoglobulin Resistance in Kawasaki Disease. Pediatr Cardiol. 2015 May 21. [Medline]. Kato H, Ichinose E, Yoshioka F. Fate of coronary aneurysms in Kawasaki disease: serial coronary angiography and long-term follow-up study. Am J Cardiol. 1982 May. 49(7):1758-66. [Medline].